The 35th edition of the Shinhan Donghae Open will become the first event in Korea to be tri-sanctioned by the Asian Tour, Korean PGA and Japan Golf Tour Organisation (JGTO), officials announced today. The Shinhan Donghae Open has been co-sanctioned by Asian Tour and KPGA since 2016 but will welcome the JGTO as its newest sanctioning partner when the event returns to the Bear’s Best Cheongna Golf Club from September 19-22. The latest tri-sanctioning agreement is part of the Shinhan Financial Group’s “2020 SMART Project,” where its aim is to broaden the group’s global reach and position Shinhan as the leading financial group in Asia. Additionally, the Shinhan Financial Group aims to solidify its “One Shinhan Brand” in Japan while making its inroads to future growth markets in South East Asia. “Playing in international tours is no longer a choice, but a must for Korean pro golfers. 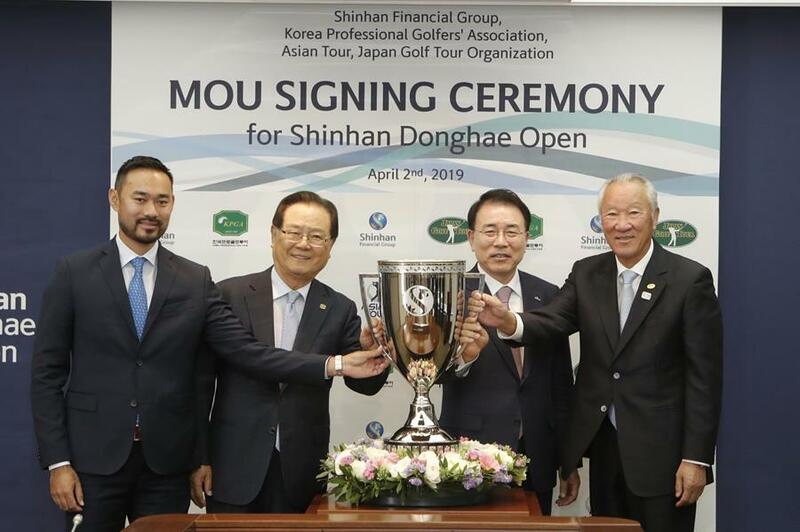 The Group shall cooperate with the three tours to ensure that Shinhan Donghae Open is a truly international tournament, where all world-renowned golf stars come to compete and advance,” said Shinhan Financial Group’s Chairman Yong-byoung Cho. Cho Minn Thant, Chief Operating Officer of the Asian Tour welcome the move and said: “The Shinhan Donghae Open is a storied event within the golfing landscape of Asia. We have seen many great champions from all over the world victorious over the years and we are here today to welcome the participation of our counterparts from the Japan Tour. Korea’s Sanghyun Park, who finished second on the Asian Tour Order of Merit in 2018, claimed a wire-to-wire victory at the Shinhan Donghae Open last year. Other Asian Tour winners who have won the Shinhan Donghae Open include India’s Gaganjeet Bhullar (2016) and Canada’s Richard T. Lee (2017).